Week 38 – Excerpt from my new book, Waking Up in Winter! 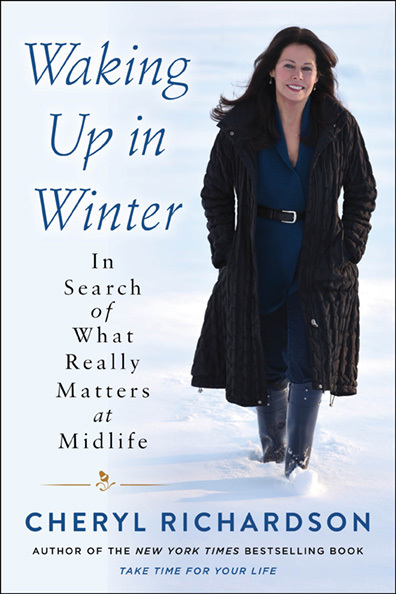 This week I’m excited to share a bit of my next book, Waking Up in Winter: In Search of What Really Matters at Midlife. This new book is a memoir in journal form where I offer you an inside look at how I live a life dedicated to growth and healing. After writing six self-help books, I answered a midlife call to reevaluate everything –my work, my relationships, my health and more and, in doing so, made the decision to teach by example. This new form will show you how to use day-to-day experiences as a catalyst for growth and empowerment. It also invites you to awaken to a stronger connection with your inner life, which is the only true way to find peace and meaning in a challenging world. Waking Up in Winter will be released on December 19th and this week I’m sharing the first journal entry because it was the gentle (or not so gentle) nudge that began my hero’s journey. If you enjoy reading the electronic version of books, you’ll be happy to know that my publisher, HarperOne, is holding a flash sale for one day only on preorders of the eBook. The cost is only $4.99 and the sale ends on Monday, September 11th at 6pm EST. You can take advantage of the sale by going here. Here’s a really smart, thoughtful Tedx talk about overcoming the malaise of midlife by Patricia Katz. You can find it, here.